Wisteria (Wisteria spp.) adds beauty to homes with its lush, clusters of lovely purple flowers that hang from graceful vines twining up terraces, front porch pillars and along fences. 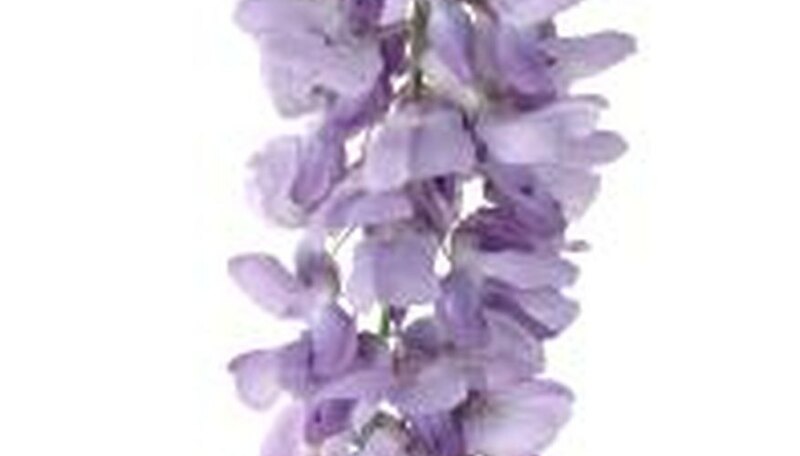 Wisteria does well in U.S. Department of Agriculture plant hardiness zones 4 through 9. It thrives in poor soil, which is why many plant experts discourage fertilizing the plant. Home gardeners, on the other hand, in their attempts to get a stubborn wisteria to produce blooms, turn to their arsenal of fertilizers. Typically, however, when a wisteria doesn’t bloom, it is proper pruning that will encourage it to put forth the flowers for which it is so loved. This is not to say the plant never requires fertilizer. Young wisteria plants require one dose of fertilizer in the spring, annually. Continue this schedule until it has filled in the space you’ve created for it. Once this occurs, discontinue fertilizing the plant unless it shows signs of deficiency, such as yellow foliage or leaves that remain small. Wisteria is a member of the pea family and creates its own nitrogen from the air. Consequently, the addition of a nitrogen fertilizer to the soil creates an excess that promotes vegetative growth at the expense of flowering. A soil test every spring will tell you what type of fertilizer your wisteria requires. Mature plants with deficiencies should receive fertilizer in spring. When the wisteria is young, the gardener’s focus isn’t on blooming, but on getting the plant to fill in the arbor, wall or other space created for it. Vigorous vegetative growth is encouraged by nitrogen, so use a balanced fertilizer, such as 10-10-10, on the juvenile wisteria. In maturity, the plant requires high levels of potassium and phosphorous. Only a soil test can let you know which of these nutrients is deficient in the soil. If the wisteria requires a dose of phosphorous, apply superphosphate, or 0-20-0 at a rate of 2 ounces per square yard of soil. Potassium sulfate at 1 ounce per square yard will cure a potassium deficiency. Wisteria produces a deep, wide ranging root system. Add the required amount of fertilizer to the hopper of a handheld fertilizer spreader and apply it evenly, starting 6 inches from the plant’s base and spreading to 6 feet out in all directions. Use a rake to scratch the product into the top layer of soil, and then water to a depth of 2 feet. The water helps activate the fertilizer and carries it to the roots. The application rates for fertilizer, superphosphate and potassium sulfate are general rules of thumb. Use your soil test results to determine the appropriate application rate for your situation. The back of the fertilizer or supplement package typically contains a chart that tells the gardener how much of the product to use for different soil fertility levels.